When news broke that Babylon 5 might be making a comeback in the form of a feature length movie, I wrote a piece that started out as one thing but turned into something else. You can read the long version here. The short version is that I was always quick to snark about Michael O’Hare as Commander Jeffrey Sinclair. Then I did a little research and discovered that while O’Hare was working on Babylon 5, he was suffering through some considerable mental illness. This revelation gave me pause. I started watching the series again. If nothing else, I felt I owed the series and the late O’Hare that much for all the times I called his performances cardboard. While the series still has its warts in the first season – and beyond – I now find myself noticing some of the more subtle ways the show approaches mental health issues. For the purposes of this ever-so-brief discussion, the common point of reference is the Battle of the Line. For those who don’t know, The Battle of the Line is a seminal point in Babylon 5’s internal history. It represents humanity’s doomed effort to defend the Earth against a wholesale slaughter from the Minbari. 20,000 people volunteered to stall the Minbari advance, allowing civilian ships time to escape to neutral territory, and only 200 survived the encounter. Those who did manage to endure the Battle of the Line only did so because the Minbari surrendered to Earth for reasons that are a little too complicated to detail right now. Here’s some video. 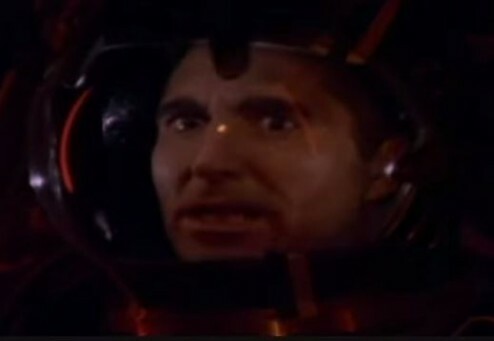 No character in Babylon 5’s dramatis personae is as affected from the Battle of the Line as Commander Sinclair. After surviving the entirety of the Earth-Minbari War, Sinclair volunteered to hold the line against the Minbari fleet. Like all the other the other pilots on the line, Sinclair was ready to die for the cause. Unlike those pilots, Sinclair managed to find some agency over that demise. After watching his entire squadron die, Sinclair set his ship to ram the Minbari flag ship as a final act of defiance. Little did Sinclair know, he had a destiny. The fates, and the Minbari, conspired to spare Sinclair from his kamikaze run. In the past, I don’t think I ever noticed, or maybe I just wasn’t quite well read enough to appreciate the subtle ways the writing carried forward that ultimate denial in Sinclair’s character. In some ways it reminds me of a scene in James Clavell’s Sho-Gun. Blackthorne refuses to be responsible for an entire village being destroyed if he’s not able to learn Japanese in six months. Rather than live with the burden, he announces he will commit Seppuku. Though his suicide is prevented, Blackthorne comes away from the event a changed man. He could see the end of his life, and just like Sinclair, that end was taken away from him. While I have no personal experience to draw upon that is comparable, I can imagine it might be difficult to find a purpose in life when you have to live with the knowledge that everything about who you were came to a single point, which was then taken away from you. In Sinclair’s case, the series regularly offered up commentary on how he was trying to find a new purpose for himself. Despite continuing his career in Earth’s military and then building the Rangers, a shadow army comprised of Humans and Minbari, Sinclar literally has to be reborn as Human-Minbari hybrid before he can take back the agency that he lost on the Battle of the Line. Perhaps some of O’Hare’s seemingly subdued acting amid a cast of over-the-top character players is due to the fact that he saw something in Sinclair that necessitated a level aloofness. Sinclar had a liminal moment stripped from him. Granted, that’s not as dramatic as watching Garibaldi actively manage his alcoholism, but it’s certainly a way to see that there may have been some hidden depth to O’Hare’s acting. It also lays the foundation for what would become an ongoing dialogue with mental illness in Babylon 5, but I’ll save that post for another day.